What happens when you combine a two-story luxury suite, more than 20 restaurants and unrivaled entertainment with voyages to the Mediterranean and Caribbean? 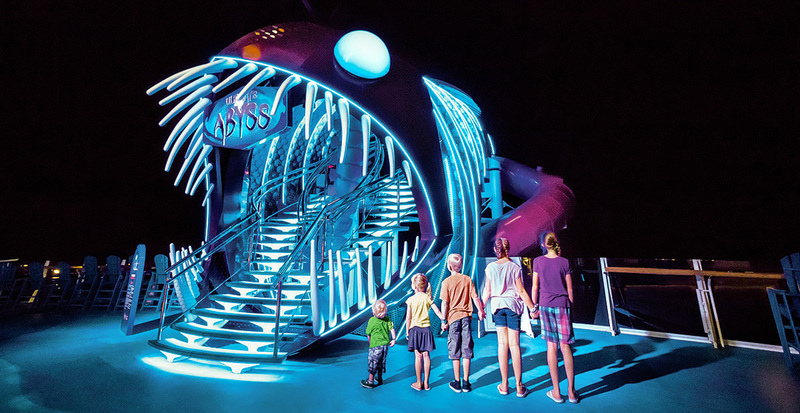 You get epic adventures and a crescendo of fun family moments on the largest cruise ship in the world — Symphony of the Seas℠. Let us give you an insider glimpse into Royal Caribbean’s newest ship, debuting in Barcelona this spring and breaking ground in Miami’s brand-new cruise terminal in fall 2018. Experience the new sound of whoa when sailings begin March 2018. Your vacation of firsts begins even before you board Symphony of the Seas℠. This is a perception-remixing, memory-maxing mic drop. It’s all the greatest hits, plus revolutionary new firsts. The new sound of adventure launches this March for an inaugural season in Europe before earning bragging rights as Miami’s biggest thrill in the fall. 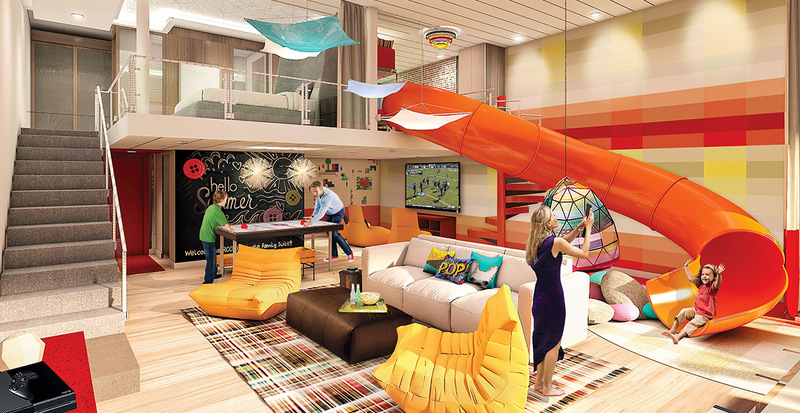 The Ultimate Family Suite is just one of many awesome accommodations aboard the newest Oasis Class ship. With an interactive building block wall, an air-hockey table and a private theater, the entire family may never want to leave this two-level playground. Plus, if stairs aren’t your style, take an exclusive slide from the kids' bedroom down to the living room. The excitement continues outside to a wraparound balcony that features a full-size whirlpool and balcony table tennis along with expansive ocean views. 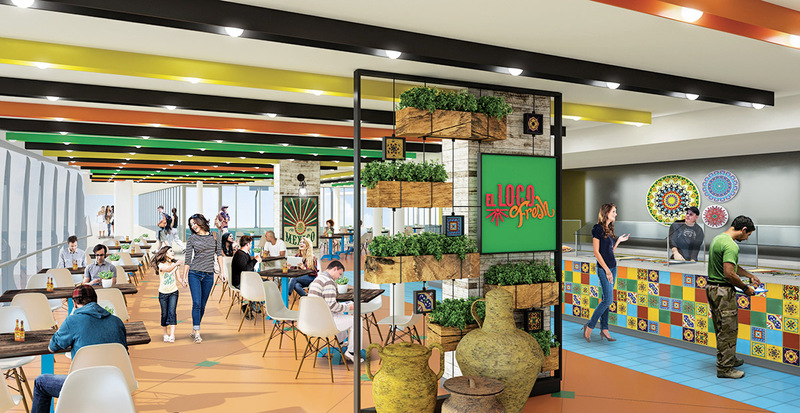 Hear the sizzle and savor the fresh, bold flavors at Royal Caribbean’s newest restaurants. There is something for everyone in your crew at El Loco Fresh℠, where tacos, burritos and other mouthwatering Mexican favorites are made to order. Then satisfy your sweet tooth at Sugar Beach℠ candy and ice cream shop. 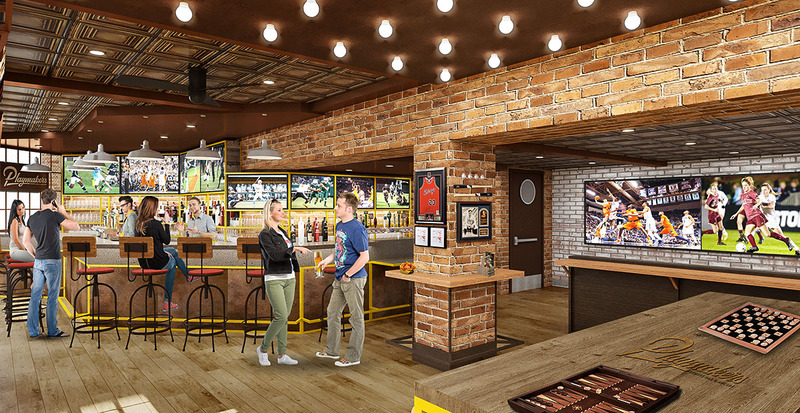 Game on at Playmakers℠ Sports Bar & Arcade. Kick back with mouthwatering wings and craft beer as you watch your favorite team on the big screen, or get your adrenaline pumping with arcade games. Get a taste of New England at Hooked Seafood℠. You'll have your pick of fresh local fish, lobster, a variety of crab claws and a mouthwatering selection of just-shucked East Coast oysters at the ice-cold raw bar, served with sweeping sea views. Entertainment is elevated to the next level with both new activities and old favorites. Have some family competition during glow-in-the-dark laser tag, dance to the classic Broadway hit "Hairspray," and watch the original show “Flight” for a comedic take on the evolution of flying. Don’t worry, fan favorites are still accounted for — take the plunge on the Ultimate Abyss slide or hang 10 on the FlowRider® surf simulator. Take your family on the best vacation yet. 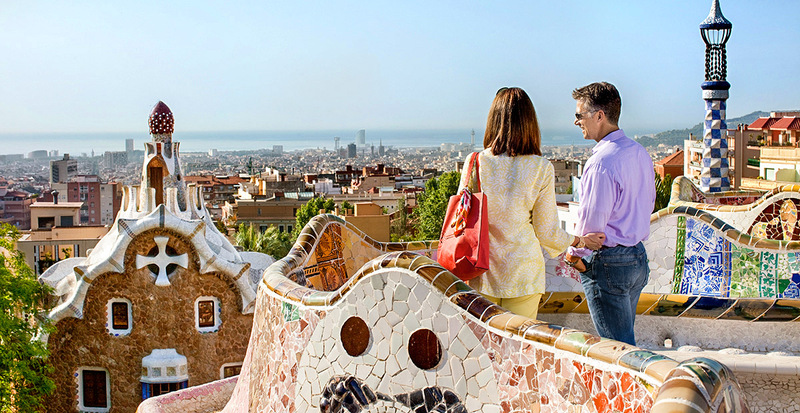 From May to October — perfect for summer break — Symphony of the Seas℠ sails the Mediterranean, visiting the famed ruins of the Colosseum in Rome, the colorful artworks of Gaudí in Barcelona and the charming coastal village of Cinque Terre. 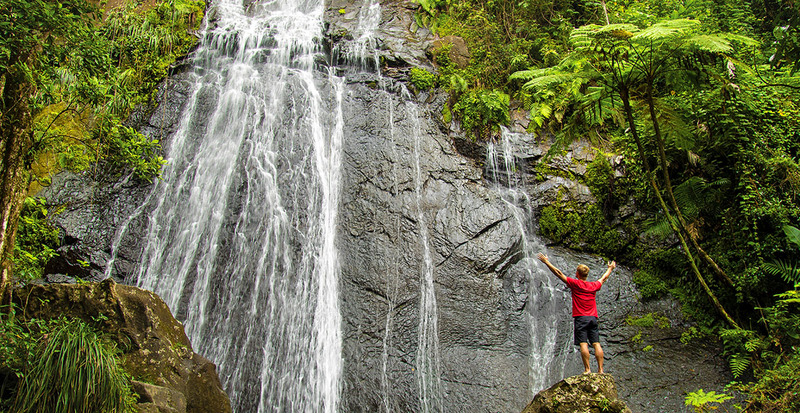 Then, beginning in November, the ship heads to warm waters, cruising the Eastern and Western Caribbean, where you can explore Puerto Rico’s lush rainforests, uncover Maya temples in Cozumel and snorkel in the underwater wonderland of CocoCay®, a Royal Caribbean private island destination in the Bahamas. Go behind the scenes with Symphony of the Seas℠! Enjoy 30% Savings + up to $1,000 Instant Savings per couple* + Kids Sail Free** on your next Royal Caribbean® family adventure. Plus, enjoy our exclusive Complimentary Specialty Dining Experience for two. *** Call us today to start planning! *Offer applies to new bookings made March 1 – 28, 2018, for seven nights or longer on Caribbean, Bahamas, Bermuda or Canada sailings on all Royal Caribbean® ships departing on or after May 1, 2018. Instant Savings offer is per stateroom for suites only based on Royal Suite Class tier: $1,000 for Star Suites; $500 for Sky Suites; $200 for Sea Suites. Plus inclusive Royal Suite Class and DINE, DRINK, DISCOVER benefits. Call us for details. **Offer applies to new bookings made March 1 – 28, 2018, for four nights or longer on all Royal Caribbean® ships departing April 7 – May 31, 2018, and September 1 – December 17, 2018, on Europe, Bahamas, Bermuda, Hawaii, Canada, Coastal and Caribbean sailings. Restrictions apply. ***Complimentary Specialty Dining Experience for two applies to new bookings made March 15 – April 30, 2018, for seven nights or longer on Caribbean or Bahamas sailings on qualifying Royal Caribbean® ships departing July 1 – September 30, 2018. Our exclusive offer applies to Balcony staterooms and above. Additional restrictions apply. 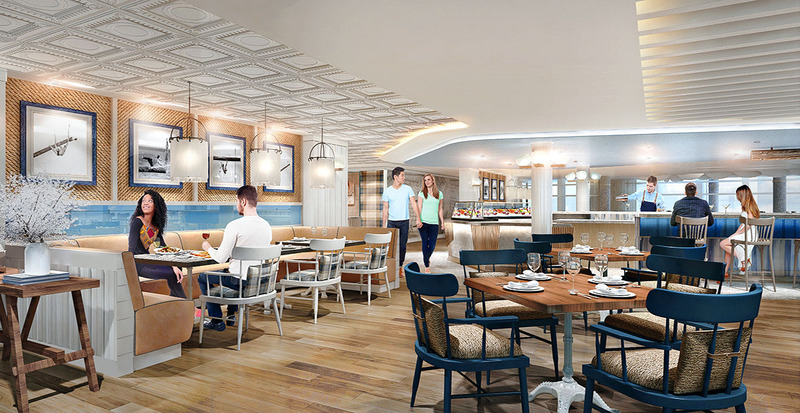 Images of Symphony of the Seas℠reflect current design and may include artistic renderings and/or images of existing Oasis Class ships. All ship features, experiences and itineraries are subject to change without notice. When we plan your Royal Caribbean voyage, you can enjoy peace of mind knowing that all the details are taken care of, from tours with local guides to shore excursions every member will enjoy.